This famous dish enticed my whole family’s appetites. 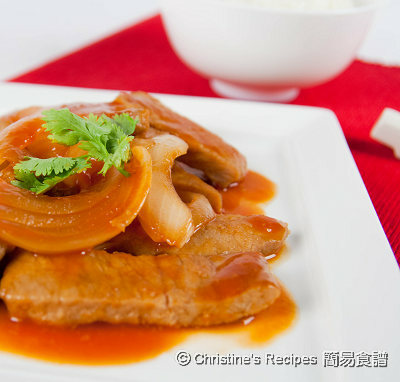 However I made a little tweak of using pork chops that usually used spareribs in the traditional way. This is all because of my hubby’s preference to pork chops over spareribs. He said spareribs are too bony, not enough meat for him. Ok, he’s right. Our body can only digest meat not bone. Moreover, spareribs are quite expensive here in Australia. 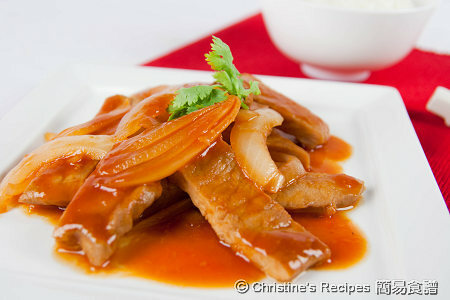 So I used pork chops and kept the traditional way of cooking Peking sauce. You can keep using the spareribs if you like, of course. Rinse pork chops and wipe dry. Marinade for about 20 minutes. Melt brown sugar pieces with a bit of water. Prepare sauce for later use. Fry pork chops on medium heat until both sides are lightly brown. Set aside. Add 2 tablespoons of oil in frying pan, sauté onion until translucent. Add minced garlic in the middle of frying pan, and sauté, stir with onion. Pour the sauce mixture into the pan, add pork chops. Lower the heat and simmer for a while, until sauce dry up a bit and consistency to your preference. Dish up, enjoy! I tried this recipe last night for dinner and it was so wonderful! Thank you for sharing this on your blog. I can't wait to try your other pork recipes, especially the adobo one. I'm glad to know that you tried this recipe and loved it. Wonderful! It seems that you love eating pork chops. Worth trying the adobo one, it tastes good too. Brown sugar 片糖 is like this, click to view the picture. I just take one piece and break into half. It's available at Asian stores. Wow i love ur blog, all nice n yummy recipe! I love to try them all! After reading ur post , I'm gonna make pork chop today! Hi, sorry for this silly question. Do I add marinade to the cooking or sauce, or do i throw it out? Thanks! There's not much marinade left as the pork chops actually will absorb it. If any left, just cook with the sauce, don't waste it.